I’m appalled that the Ministry of Defence is applying to deregister Hilton, Murton and Warcop Commons near to Appleby -in what Commons campaigner Kate Ashbrook has described as “the biggest threat to Common Land Since the Enclosure Movement”. Now we walk a great deal on these threatened lands, which are part of the North Pennines Area of Outstanding Natural Beauty. It’s stunning scenery and offers real wild walking of the finest quality. I hope this will be vigorously resisted. These commons represent 3% of the stock of common land in Cumbria. 15 years ago the MoD applied to extinguish the common rights over the land to give them more control and flexibility. At that time, they stated categorically that they would not apply to deregister the land as common land. This is now precisely what they have done, with little or no evidence as to why. The applications are strongly opposed by ourselves, the Open Spaces Society (OSS), the Foundation for Common Land, the Federation of Cumbrian Commoners, and the local residents. Local and national organisations(1) are campaigning to stop the Ministry of Defence from destroying a vast area of Cumbria’s cultural history. The MoD wants to deregister three large upland commons(2)and turn them into private land. Objectors say the deregistration would be unlawful and flies in the face of undertakings made by the MoD, at a public inquiry, to keep the commons registered in perpetuity(3). MoD will privatise around 1% (4,500 hectares) of England’s total common land(4) if Cumbria County Council grants it permission(5). This would be the largest enclosure since the major enclosures of commons in the eighteenth and early nineteenth centuries. The threatened commons are to the north-east of Appleby-in-Westmorland, in the North Pennines Area of Outstanding Natural Beauty. If the land is deregistered, it will bring to an end hundreds of years of tradition of upland commoning, and the farming community, which used to have vital grazing rights over this land, would be denied any opportunity in future to graze their stock there. The land would also lose protection against encroachment and development since works on common land require the consent of the Secretary of State for Environment, Food and Rural Affairs in addition to any planning permission. 1 The organisations are: Hilton Commoners’ Association, Cumbria Federation of Commons, the Foundation for Common Land, the Friends of the Lake District, and the Open Spaces Society. 2 Common land is land subject to rights of common, to graze animals or collect wood for instance, or waste land of the manor not subject to rights. The public has the right to walk on nearly all commons, and to ride on many. Any works on common land require the consent of the Secretary of State for Environment, Food and Rural Affairs, under section 38 of the Commons Act 2006, in addition to any planning permission. The three registered Commons are Hilton, Murton and Warcop. The applications to Cumbria County Council are listed as CA14/3 -CL26 Murton; CA14/4 -CL27 Hilton Fell; & -CL122 Burton Fell and Warcop Fell. 3 A public inquiry, held in Appleby in 2001, led to all grazing rights on the commons being bought out by the MoD. In return the MoD created some additional access opportunities on Murton Common and undertook not to deregister the Commons. It also undertook to create new common rights to ensure that the commons would exist in perpetuity. These limited rights were never delivered by the MoD. 4 Cumbria contains around 31% of the registered common land in England which is mostly in the uplands—the Lake District, Yorkshire Dales, and North Pennines. The area covered by commons in Cumbria is 112,786 ha and these three commons cover some 4,500 ha. 5 Cumbria County Council is the commons registration authority for the county and has received three applications from the MoD to deregister the commons of Murton, Hilton and Warcop. The Council will determine the applications but the objectors believe that if it approves them, it would not be in accordance with the Commons Act 2006. 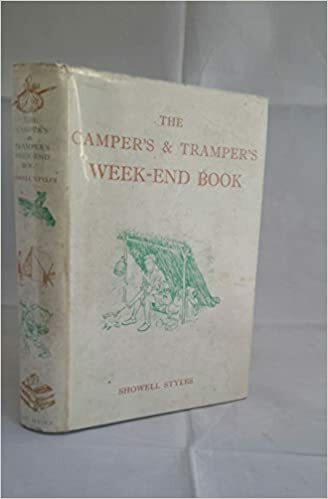 The Camper’s and Tramper’s Week-End Book by Showell Styles is one of those lovely books about walking in the countryside that appeared in the 1950s – in a world free of horrid words relating to walking such as stakeholder, Lycra, recreational paths etc. Its author, Showell “Pip” Styles, was one of those walking and climbing phenomenons who’ve sadly gone out of fashion in this tiresome 21st century. He wrote a huge number of books on the outdoors, plus novels, and a great deal of walking and climbing journalism. As the title implies, this is a book to dip into. I can promise you that once you start dipping it’s impossible to stop. Showell Styles had a wonderful way of getting the joys of walking across to the reader. You’ll feel so enthused that you’ll be aching to get out there and camp or tramp. The second section deals with more legitimate camping, with chapters on life under canvas, mountain camping, camp cookery and the highest camps. I was given a copy of Showell Styles’ book when I was a child and it’s been by my side ever since. It inspired and gave a practicality to my own long tramps around the British countryside, when I spent many a night in barns, billets, rough shelters, caves, hollows in rocks and amongst sheltering trees. Well worth seeking out – it’s out of print, but you see it sometimes in second-hand bookshops and online book dealers. Showell Styles wrote a pleasant companion volume too, The Mountaineer’s Weekend Book. Lovers of the outdoors should seek out both.